AncestryDNA match category spread for my family's tests. Subtracting those 50 matches and the 3 immediate family from her total shown 4th Cousins or closer match total and she has 2,266 4th cousins. 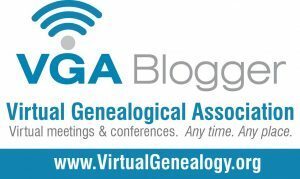 For the record all of Mom's 3rd cousins or closer have been asked if they would consider uploading their results to GEDmatch. Looking at Mom's matches made me curious how the numbers compared to my results as well as those of my daughter, and my sister. Mom is very fortunate to have many of her closer cousins who have tested. I wish more of the closer cousins would upload to GEDmatch. It certainly would make sorting the matches easier. In the end though it is their choice and more times than not, it is just not a priority for them. Wanted to read through the Census for the area where my Upshaw/Patton lines had lived. They would have been gone from the area for likely at least 15 yrs by the time this census was taken. I see a lot of Cooks and also some familiar names like William King and Leroy Upshaw. The Upshaw may be a cousin as the age was too young to be my direct Leroy Upshaw. I'm sure there are errors in this listing as it is my attempt at reading the handwriting from the scanned images. That said, the writing is worlds better than some I've tried to decipher. Searching Newspapers.com for Cooks in the middle Tennessee area I found a List of Letters Advertisement. Remaining in the Post Office at Nashville on the 15th day of April. Persons applying for the letter to the following list, will please say "ADVERTISED"
Not in my line that I know of but I was curious as to why he hadn't gotten the letter. Looking at a timeline of events from records I found it appears he had moved from the Nashville area to Newton Co MO where he remained until sometime between 1870 and 1880 when he moved to Carroll Co., Arkansas. After the death of his first wife it appears he married Kitty who had been living in his household since 1850. Was Kitty kin to his first wife who was also born in TN. Did he ever receive the letter? Rabbit holes for another day. The following sources were consulted as I fell down the rabbit hole. Ancestry.com. Tennessee, State Marriages, 1780-2002 Oct 16 1839 (it was indexed as 1840 and in the 1878-1886 book [database on-line]. Lehi, UT, USA: Ancestry.com Operations Inc, 2008. Ancestry.com. 1840 United States Federal Census, Tennessee, Davidson Co. City of Nashville Ward 4 Image 41 of 257 [database on-line]. Provo, UT, USA: Ancestry.com Operations, Inc., 2010. Ancestry.com. 1850 United States Federal Census Missouri, Newton Co. Van Buren Twp. Images 12 & 13 of 14[database on-line]. Provo, UT, USA: Ancestry.com Operations, Inc., 2009. Ancestry.com. 1860 United States Federal Census Missouri Newton Co. Van Buren Twp. Images 9 of 25. [database on-line]. Provo, UT, USA: Ancestry.com Operations, Inc., 2009. Ancestry.com. 1870 United States Federal Census Missouri Newton Co. Van Buren Twp. Newtonia P.O. Images 12 of 33[database on-line]. Provo, UT, USA: Ancestry.com Operations, Inc., 2009. 6. Ancestry.com. Missouri, Marriage Records, 1805-2002 [database on-line]. Provo, UT, USA: Ancestry.com Operations, Inc., 2007. Ancestry.com and The Church of Jesus Christ of Latter-day Saints. 1880 United States Federal Census Arkansas, Carroll Co., Eureka Springs Image 15 of 57 [database on-line]. Provo, UT, USA: Ancestry.com Operations Inc, 2010. Genealogical details in an advertisement. My Daughter, Brittany's Folley line is her most recent immigrant line. George Folley(her 3rd Great Grandfather) brought his family to the USA about 1887. At the time, his family consisted of his wife and their two daughters. His wife would die in 1888 of Yellow Fever. George was a tailor and remarried in New York to Barbara Klemme(from Franklin Co IN) about 3 years after his wife's death. Franklin County, Indiana is where most of Brittany's Paternal Grandfather's German ancestors lived. George and Barbara lived in Campbell Co Kentucky for awhile before moving on to Cincinnati Ohio. I recently subscribed when I noticed a good deal on their Publisher Extra subscription which they were offering to Ancestry.com subscribers. Imagine my surprise at finding genealogical information in an advertisement. The subscription price is well worth it. I found the details of George's Death published in The Cincinnati Enquirer and also ran across an advertisement from about 25 yrs prior to that which gives a little background about George's employment.